When spouses are enmeshed in a divorce proceeding, they often do not see “eye to eye” on matters of child custody. In many cases, both parties want to be able to spend as much time with their children as possible after the divorce. Unfortunately, disputes over custody can be intense and emotionally difficult for all of the parties involved. Keep in mind that in any child custody case, the court will seek to protect the best interests of the child, especially when parents are unable to agree on a parenting plan. To be sure your rights are protected in a child custody or divorce matter, you are encouraged to contact an experienced San Diego family law attorney who is fully aware of the local laws applicable to your case. Under the California Family Code, Section 3111, if parents are contesting custody or visitation, the court has the authority to appoint a child custody evaluator to conduct a custody evaluation in cases where the court deems it to be in the best interests of the child. In a recent marital dissolution case, the court appointed a child custody evaluator to evaluate this “hotly contested” custody matter. The evaluator was involved in the case from the fall of 2012 through the spring of 2013. In April 2013, the mother petitioned the court for the removal of the evaluator and to strike her evaluations due to bias. At the hearing on the motion, the mother’s attorney argued that the evaluator’s emails established bias in favor of the father, warranting her removal. While the trial court pointed out that this was a “close case that raised serious questions about the evaluation,” it ultimately concluded that there was not enough evidence of bias to justify disqualifying the evaluator or striking her evaluations. The mother filed legal papers objecting to this ruling. The court of appeals reviewed the mother’s evidence, including the November 2012 evaluation, which contained numerous references to the mother’s “mental status, problems and issues.” The court also reviewed the evaluator’s communication to the mother’s therapist, who requested that any implications of severe mental illness be taken out of the report because, for one, there was no such illness, and two, the mother was functioning perfectly normally, outside of this custody dispute. There were other suggestions of bias, such as the evaluator’s alleged mischaracterization of a physical incident between the spouses that made it seem as if the mother was at fault, and the mother’s therapist’s email suggesting that the evaluator was biased and had left out facts unfavorable to the father. Furthermore, other professionals complained that they had been misquoted or that their statements had been taken out of context. The court looked at the “totality of the circumstances” in concluding that the evaluator’s actions exhibited bias. The court cited the evaluator’s willingness to make changes in her first report that presented the father in a better light, while ignoring other information that was favorable to the mother, as well as certain email messages to the father discussing items that were beyond the reach of the evaluation. This case illustrates another complex facet of a child custody dispute: the role of the evaluator. If you are considering a divorce, it is essential that you assess and understand your rights as early in the process as possible. 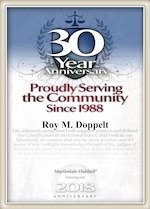 Roy M. Doppelt is a seasoned divorce attorney who has more than 20 years of experience assisting clients with child custody cases throughout the State of California. Doppelt and Forney, APLC serves clients in San Diego, Encinitas, Scripps Ranch, Linda Vista, and throughout Southern California. To schedule a free confidential consultation, call Doppelt and Forney, APLC toll-free at (800) ROY IS IT (769-4748) or contact us through the law firm’s website.